Resolutions not for you? Because they usually got flushed down the toilet before March rolls around? Let me share a bit about my goal-setting with you. I used to not set any New Year resolutions for many years. For one, I didn’t really know what I wanted, and two, I was doubting my ability to make things happened… Oops… I was worried that I might set myself up for disappointment. So to avoid that, why set resolutions? However, a few years ago, I developed this urge to set a New Year resolution. I started small with just one resolution. 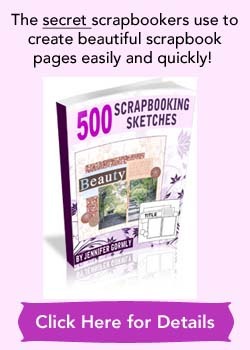 About taking up a course which I felt was a strain on my budget back then, but it’s achievable. I set it and I hit it. It’s not a big thrill as it’s a rather low goal but it got me excited about New Year resolutions. For the next year, I increased my number of resolutions and this year, I got 12. I usually scrapbooked in retrospective, reviewing the wonderful bits that happened during the year. It’s the first time I’m scrapbooking about my New Year resolutions at the beginning of the year. So come join me! Set aside some time to come up with some goals you’ll really like to see happened. Dropping that extra 5 pounds? Starting on a healthier fruits and vegetables diet? 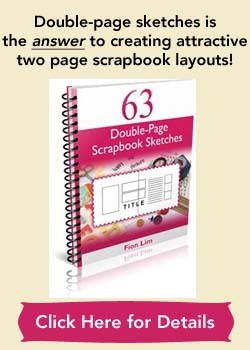 Scrapbook 30 layouts? Learn to bake that success-proven Tiramisu from your best friend? Take up a beginner yoga class? Are there goals you set in 2008 but didn’t follow through? Maybe you can recommit to that goal this year. Oh, and before that, I’ll like for you to celebrate your previous successes. Learn to appreciate and value what you’ve already accomplished so far, as that’ll set you internally motivated to wanting to achieve more. 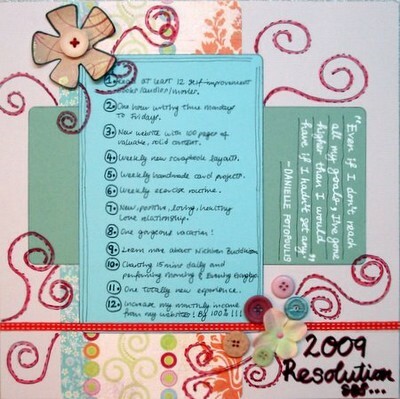 This scrapbook page on your New Year resolutions will be one that’s going to be looked over many times in the future. It lets others know that you’re someone with goals, dreams and hopes. It’ll remind you of what you used to think is important enough to want to set it as a resolution. It’ll also play another role. As a constant reminder to you over the next twelve months about where you’re wanting to head towards! Supplies used: Cardstocks – Bazzill Basics and The Paper Company; Patterned papers – Basic Grey Romani “Bohemian” and Urban Couture “Jacquard”; Orange stitched ribbon – Celebrate; Buttons – Autumn Leaves “Foof-a-la”; Black Marker – Zig Memory System “Dotta-Riffic”; White pen – UniBall Signo Broad “White”; Black pen – Zig Memory System “Millennium”; Brown and red pens – Zig Memory System “Fine & Chisel”; Pink brad – KCK Craft; Silk flower – stash; Red embroidery floss – DMC; Corner rounder; Sketch: Pg 52 of Scrapbook Page Maps: Sketches For Creative Layouts . Love these ideas – thank you.